Members of this cult seek to harness the power of Imix, the Prince of Evil Fire, and ravage the world with volcanic eruptions, forest fires, heat waves, and droughts. 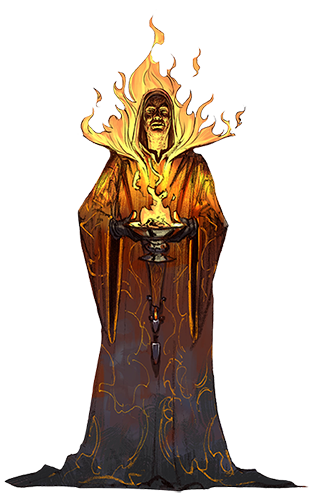 Fire cultists are aggressive, fervent, swift to act, and quick to anger. They confront their enemies head-on, without fear of consequence. They are also masters of fire and forge. Born in Calimport, Vanifer was a dancer who became a pasha’s concubine. She incorporated fire into her dance routines to impress the pasha’s guests. However, she grew to despise her master’s court and fled at the earliest opportunity, taking a small fortune in jewelry with her. She hid in Zazesspur for a while... until her master’s servants caught up with her. She fled to Little Calimshan, a cloistered settlement outside of Baldur’s Gate, and hid there for a couple years until she felt comfortable opening a small dance school that served as a cover for her fledgling fire cult. Vanifer has attracted a number of loyal followers who share her destructive predilections, including a Chultan barbarian bodyguard (Jaka) whom she befriended in Little Calimshan and an “awakened” fire elemental (Incinerath) that believes itself an avatar of Imix. Imix wants to spread fire and burn all that can be burned, leaving nothing but ashes behind. He is temperamental and unforgiving. His natural form resembles a pillar of fire with smoldering black pits for eyes.